Utah’s Lone Peak tops at out 11,263’ and is considered the most difficult 11,000+ peak in the Wasatch Rage due to the mileage and vertical gain. It is an imposing peak, visible from Salt Lake City to Provo. With an average grade less than Mount Olympus (17% vs. 23%), I figured the extra miles wouldn’t be an issue. What I didn’t count on were the effects of the altitude, combined with my asthma, but more on that later… Lone Peak was a satisfying adventure without question and I plan to hike it again. We got a late start and inadvertently selected the longest route to the top. Starting from the Orson Smith Trailhead we hiked the Cherry Canyon Logging Trail which climbs 6,463’ and measures 14.4 miles round trip. The switchbacks weren’t noticeable thanks to good conversation on the way up, but seemed endless on tired legs later that night. Scrub oak dominated the landscape for the first few hours before giving way to thicker trees. Along the way we passed a spring and small creek where we found a nice lunch spot in the shade, and then continued toward Outlaw Cabin. Instead of following the standard route from the cabin, we scrambled up a drainage rising out of the meadow. It’s an obvious route forking off to the left before reaching the cabin (or the right if you visit the cabin then retrace your steps from where you came). Jagged rock formations top the ridge and the views open up and it isn’t long before you can see the peak from across a dramatic 600-foot tall rocky cirque. The wind and cold hit as soon as we passed above the shelter of trees and terrain, prompting us to pull every layer from our packs. It was also time for some much needed calories. By this point, I was feeling the exertion of our vertical gains. Ya…my legs were screaming. I also began to feel the altitude getting to me. From the ridge the trail descends following the edge of the cirque. Make note of your route from this point toward the peak. Going down it’s obvious, but it’s not clear on the return. Luckily we were aware of this and watched for the many cairns that mark the way. The downhill section concerned me because my body felt shot and down meant a climb back up on our way out. Still, I wasn’t ready to quit. After another 30 minutes or so we reached the scramble up to the peak ridge. It was tough but achievable in spite of my feeling short of breath and bit lightheaded. 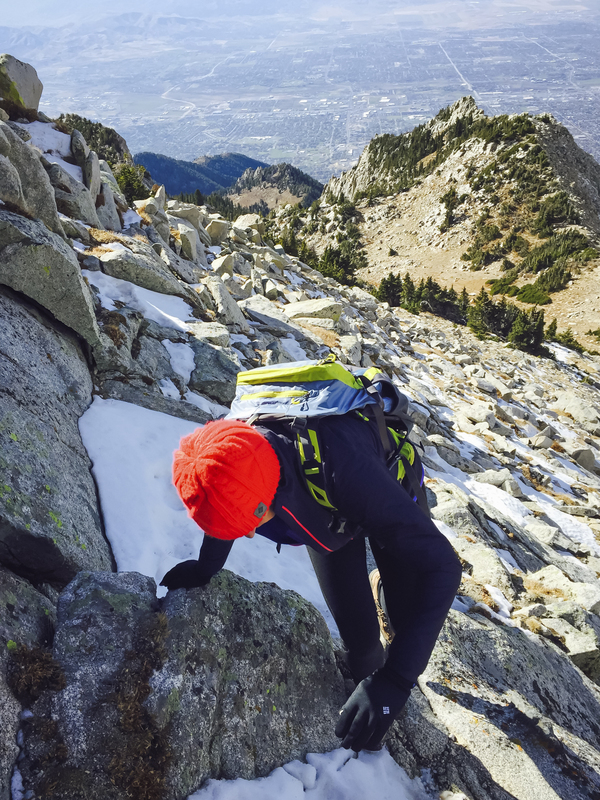 However, by the time we crested the ridge, not far from the final push to the very top of Long Peak, my vision turned to a tunnel and I plopped myself down into the rocks. This was my sign that completing the hike, even as close as I was, would be foolish. My asthma combined with the altitude had put a stop to my progress. I’m committed to safety in the outdoors. This means holding myself accountable to not create a problem when one can be prevented. The last section of this hike is a scramble. On most days, not something that would challenge me much, but it does require attention and respect to execute safely. Looking at the short distance to the highest part of the peak I felt tempted to continue, but I couldn’t take the risk. I’d nearly lost consciousness, felt nauseous, and had no appetite – I needed to turn back. It was tough to accept! I’d worked so hard to get that close. Ugh. I felt defeated and proceeded to beat myself up. I swore I wasn’t going to write about it because I felt like I’d failed, and who wants to read about that? But as I walked and consoled myself, I knew I needed to share this too. It’s all part of my commitment to authenticity in my life and on the pages of this blog. The hike was stunningly beautiful and a serious workout. I plan to return soon, taking care to be well hydrated, fed, and take it slow. I’ve also increased the intensity my cardio workouts, which had been held back by asthma until this year. It’s all a process…my process. Have you ever had to turn around from a physical challenge? Please share with me in comments. If you plan to do this hike, I recommend packing extra food, water, and layers in addition to the 10 Essentials. Also plan on spending 7-14 hours on the trail, so start early. Trail Head: Multiple from both the Salt Lake and Utah Valleys. We used the Orson Smith Trailhead. 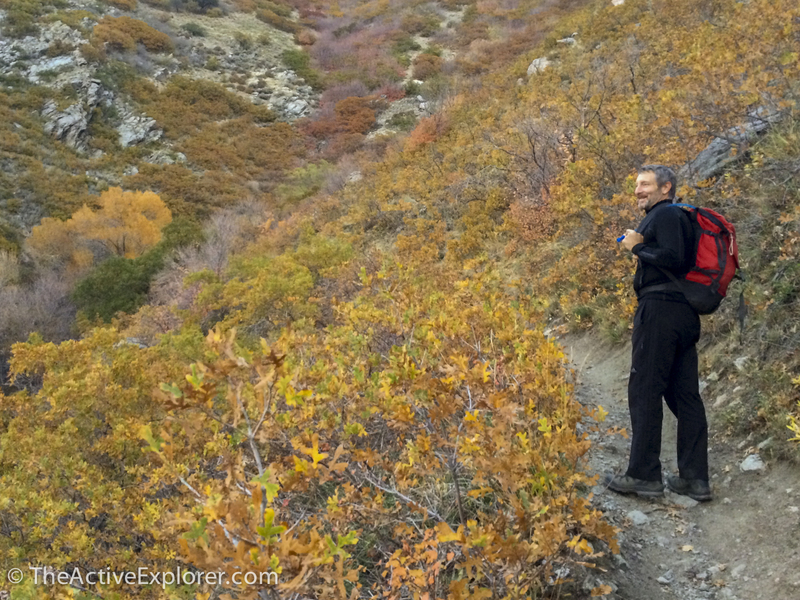 Favorite Trail Guides:Wasatch Hiker Website – Search for “Lone Peak” and Hiking in Utah. They differ on details such as distance, but really it’s finding your way that counts. We were rewarded with a spectacular sunset on our hike out. Anyone who has not had to turn back has not tryed enough stuff. I enjoyed reading your post. On my first attempt at Lone Peak I also had to turn around, mostly because of weather. Luckily I was with my nephew, otherwise it’s likely I would have continued….and that would not have been wise. Fortunately I have had the opportunity to summit many times since then. A much easier way up is Jacob’s Ladder. That peak is so exposed, it’s a good thing you didn’t push it! We plan to return so and will likely choose the Jacobs Ladder route! Anyone who hasn’t been rebuffed by a mountain is either a liar or a dead man. I got nailed with a zero-visibility June blizzard on my first shot at Lone Peak. The failure only enhanced getting to the top a few months later. Congrats on your adventures.